Netflix has slated theatrical runs for three of its awards contenders this year ahead of their streaming debuts, in a turn away from its controversial day-and-date release model, per Deadline. 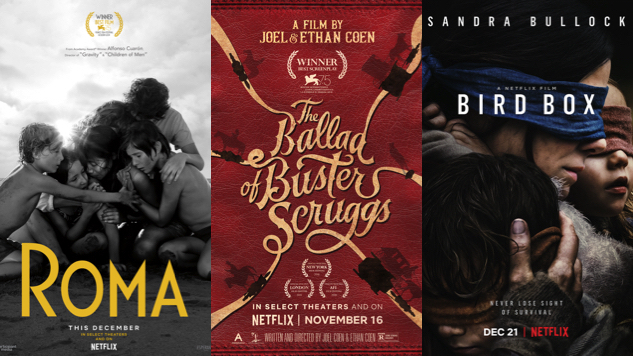 Director Alfonso Cuaron’s acclaimed Roma, the Coens Bros.’ The Ballad of Buster Scruggs and the Sandra Bullock-starring Bird Box will all get limited theatrical engagements before they hit streaming for Netflix subscribers. Prior Netflix releases would only get limited theatrical releases on the same day they hit the streaming platform, which restricted their appeal to theaters and thus made it harder for fans to catch them on the big screen. Major chains like AMC and Regal, for instance, demand a three-month exclusivity window for any movies that play in their theaters. Netflix is now revising this model, at least with its awards contenders, starting with The Ballad of Buster Scruggs. The anthology series-turned-film will hit theaters in New York, Los Angeles, San Francisco and London on Nov. 8, a week before it receives an expanded theatrical release in more cities and hits Netflix globally on Nov. 16. Director Alfonso Cuaron’s Roma, the strong awards potential for which is said to have spurred the move, is getting the longest theatrical window. Roma will have exclusive theatrical engagements starting Nov. 21 in Los Angeles, New York and Mexico, with additional engagements in other U.S. cities and London starting Nov. 29. The film will roll out in other top U.S. cities and international markets starting Dec. 7, and will continue expanding with its streaming release on Dec. 14. Netflix is also planning a 70mm theatrical rollout for the film, which was shot in that format. Bird Box will have exclusive theatrical engagements starting Dec. 13 in Los Angeles, New York, San Francisco and London, followed by a Netflix debut and an expanded theatrical rollout in the U.S. and Europe starting Dec. 21. This move will not affect releases like Private Life, 22 July and the forthcoming Outlaw King, all of which already have day-and-date releases set. It’s unclear whether this strategy will apply to Netflix’s would-be blockbusters, including director Michael Bay’s forthcoming 6 Underground, the company’s most expensive film to date. Still, the move is likely to help the awards chances for several of Netflix’s other auteur-driven big bets next year, including director Martin Scorsese’s The Irishman, Steven Soderbergh’s The Laundromat and the Joan Didion adaptation The Last Thing He Wanted, from director Dee Rees, who scored Netflix its first non-documentary Academy Award nominations with 2017’s Mudbound. That film scored four nominations at this year’s Oscars ceremony with a day-and-date release, and was seen as a sign that the Hollywood establishment was learning to embrace Netflix’s streaming-first model, but it seems that Netflix now wants to do all it can to support this year’s awards hopefuls. In the long lead-up to next year’s awards ceremonies, we’ll see how well this move pays off for the streaming entertainment titan.